The Catalina Tile Company began as a manufacturer of ceramic building materials, and developed into one of the most prestigious tile factories in Southern California. In a time of great cultural and architectural renaissance, Catalina tile produced some of the finest quality hand glazed decorative art tile of the 20's and 30's. 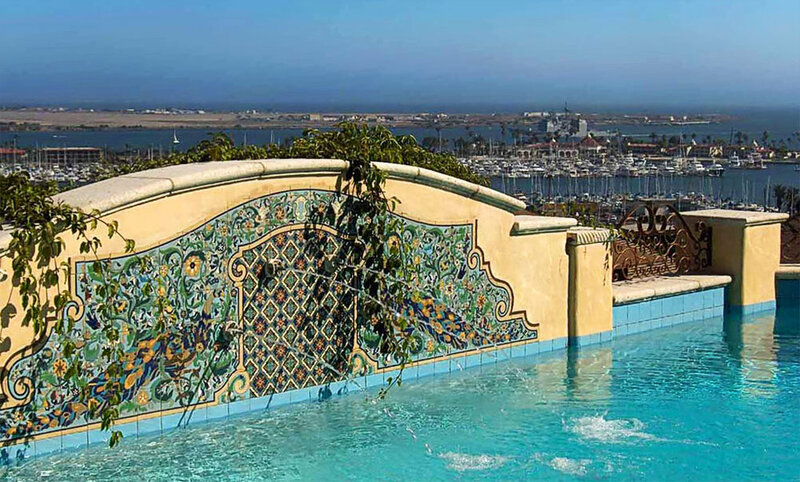 Born from the imagination of Mr. William Wrigley Jr. and his desire to lure tourists to Catalina Island, the Catalina tile company produced enormous amounts of tile, both decorative and functional, that are still prominent throughout the island today. Catalina Classic Tile carries on Mr. Wrigley’s Vision by providing the best in tile design and quality. These tile murals are reproduced by our highly trained staff of artisans, using the time-honored and traditional methods of our tile ancestors. Introducing brilliant new ways to liven up your home! Available only through a select few locations, these exclusive developed Malibu and Catalina decorative tile inserts capture the timeless elegance of the original potters from the early 20th century. Malibu and Catalina decorative reproduction tile are great for professional designers and homeowners looking to bring splashes of color to their home, architects looking to revive a project's historical splendor, or builders exploring new ideas to enrich their homes with warmth and stylish comfort. Malibu overruns consist of decorative tile that remain from large productions jobs. This new feature of Catalina Classic Tile is a unique opportunity to purchase custom Malibu and Catalina tile at fractions of the normal cost. Due to the nature of overruns and the inherent imperfections in ceramic tile, these Malibu and Catalina tiles may contain inconsistencies in color, shading, and texture that are more apparent and visible. There will be NO RETURNS OR REFUNDS with these particular products.